Who as a kid could ever resist the jangly chime of the ice cream van? There is something deeply nostalgic and special about SOFT ice cream, over generations. It retains its magic & charm, and new groups of grown-up kids around the world have lately been embracing the re-invention of what soft ice cream could be. Soft Republick is the extraordinary new ice cream brand proposition from Unilever-owned Wall’s. Setting out to disrupt and energise the global soft ice market, with the concept ‘Where art meets ice cream’. The brand concept aims to provide a vibrant, positive force for good in unsettling times – bringing local communities together over the simple joy of ‘Messy Creativity’ in the form of the delicious artistic medium of soft ice & unrestrained toppings. Targeting a wide customer demographic of older millennials with young children, as well as the Gen Z trendsetters the brand was initially targeted at, we broadened Soft Republick’s appeal – while retaining a cheeky, light heartedness and an alternative, creative spirit. We worked with a dedicated Unilever team given license to ‘think and act like a start-up’. This collaboration developed the overall Soft Republick brand strategy from positioning, customer profiling, digital and physical communications, coming together as the complete brand experience. 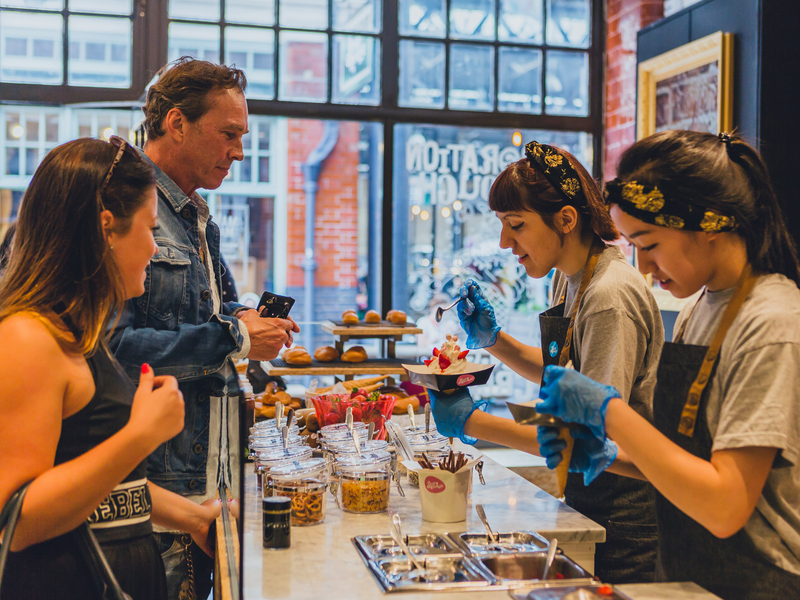 Initially trialed as a pop-up in London’s Spitalfields in summer 2017, this ice cream revolution is now being scaled-up across the globe. To do this, we further developed the brand – from product range to communications assets and a wider ‘ecosystem’ of outlets, supported by an awareness-building strategy fuelled by the brand’s core purpose of ‘Championing Creativity’. This grassroots marketing approach engages with the artist community in the local markets, recruiting them to decorate the stores and vans and providing the artists with new platforms for their work. The irresistible visual impact created by the combination of the unusual new ice cream products, the art and local ‘activation’ events, creates fuel for social media and word-of-mouth, building awareness and excitement in the market, in a fun and authentic manner. For 2018’s simultaneous launch in global markets, Brighton in the UK and Istanbul in Turkey were selected as the locations to develop the ‘ecosystems’ – with the strategy of launching, evaluating and adapting the flexible brand model in live sites, in order to provide a solid base for potential future expansion. These locations play host to a range of Soft Republick experiences that encourage self-expression, celebrate individuality and champion creativity. From full stores and kiosks to the world’s coolest ice cream vans. Flexibility was built into the brand from its very creation, seen in the highly adaptable ‘kit of parts’ of formats and visual assets, and their varying look and feel through the range of art styles. The product menu, while based on soft ice, offers an unlimited range of creative permutations, from spray-art coloured sauces, to toppings and dustings, with a range of creative formats other than cones, including the ‘Soft Dog’. The flagship ice cream bar offers a flexible art gallery chill out and events space, there’s a curated offer at smaller kiosks based in transport hubs and high footfall areas, a mobile reinvention of the traditional ice cream van and a portable plug in ice cream machine that allows flexible partnerships, with local cafes and coffee shops. Soft Republic liberates soft ice cream from its purely nostalgic associations, and is generating excitement and pleasure in store, in the press and across social media platforms. For Wall’s it’s a powerful new asset to re-energise an iconic product.